longtime litigator with both in-house corporate and in-house insurance experience, Tripp is Senior Counsel at The Hustead Law Firm. 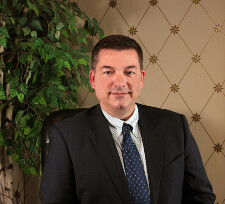 He has handled matters including complex real estate cases with serious construction defects; trucking/transportation cases with catastrophic injuries and fatalities; a broad spectrum of general-liability claims; and almost everything in between. Tripp received his undergraduate degree from the University of California Los Angeles (UCLA) and his Juris Doctor from the University of Southern California (USC). While at USC, he was elected class president, participated in the Hale Moot Court Honors Program, and was named Distinguished Oralist at Tulane University’s Mardi Gras Moot Court Invitational. During law school, he also externed for the Hon. Alex Kozinski of the U.S. Court of Appeals for the Ninth Circuit. He has been admitted to practice before all state and federal trial courts in Colorado (2008) and California (1996); in addition to having a published appellate opinion, he has tried multiple cases to verdict/judgment. Tripp is afflicted with a healthy dose of intellectual curiosity, and he is constantly seeking new challenges. After playing competitive tennis and soccer as a youngster, he took up water polo in high school, earned his Scuba certification on the Great Barrier Reef during college, and jumped out of a perfectly good airplane in law school. Despite a lack of personal playing experience, he successfully coached both youth football and youth lacrosse. Shortly after moving to Colorado, he fulfilled a long-held ambition (fostered by his coaching experience) by obtaining a master’s degree in elementary education. Prior to joining the Firm, Tripp worked at a handful of litigation firms in Southern California and the Denver area. He and his wife moved to Colorado to open a satellite office of a firm based in Los Angeles, growing the office from two attorneys to seven attorneys in only a few years. After almost twenty years as a litigator, his pursuit of new learning prompted Tripp to accept an in‑house role in the insurance industry with a highly-regarded third party administrator (TPA). Performing claims-counsel functions, he undertook risk analysis / coverage analysis, reserve assessment, and litigation management duties (oversight of outside counsel) while evaluating and resolving a wide variety of construction-defect and general-liability claims. Shortly thereafter, he was recruited to become Associate General Counsel at a leading industrial contractor; a nimble corporate generalist, he provided primary legal support to the company’s Canadian subsidiaries, assessed risk in a variety of corporate contracts, supported HR with employment matters and investigations, resolved claims and disputes with clients and vendors, directed outside counsel, and provided consultation to management on a broad cross-section of legal and risk-management issues. Having returned to his roots in litigation, Tripp brings a wealth of practical, academic, corporate, and real-world experience to the matters with which his clients entrust him. Tripp’s wife, Lisa, is a partner at a Denver-area law firm; after over 25 years of marriage, he still can’t figure out why she continues to put up with him. Away from the office, he enjoys skiing, hiking, cooking, reading, games/puzzles, golf, poker, scuba diving, and family road trips to Bruin football games and his daughter’s lacrosse tournaments. When he manages to find some spare time, his favorite pastime is just being “Dad” to his two amazing kids.